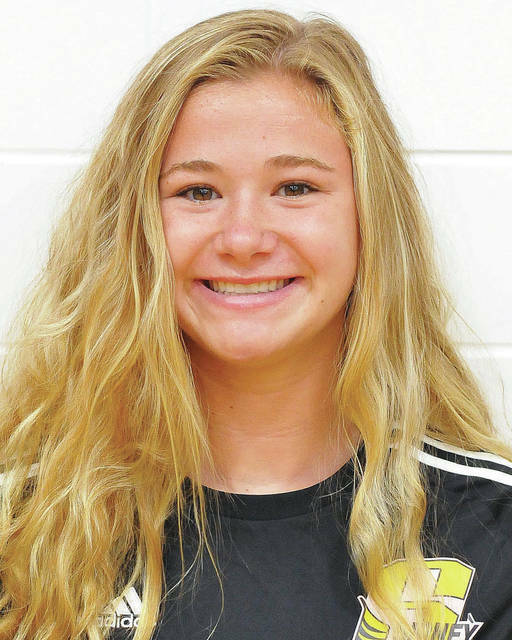 XENIA — Elaine Wiesenmayer broke Sidney girls soccer’s all-time career goals record in the team’s 7-1 win over Xenia on Monday. Wiesenmayer, a senior forward, scored four goals and had one assist in the victory. Her career goals total now sits at 72. The previous record was held by Kara Martin, who scored 68 goals between 2000 and 2003. Wiesenmayer also has 44 career assists after Monday, which is a school record. Lauren Barker scored two goals on Monday and Jada McMillen scored one. Khia McMillen led the squad with four assists, while Katie Atwood, Morgan Heckler and Barker each had one. Sidney had 16 shots on goal and seven corner kicks. Makayla Hurey had eight saves on goal. Sidney (3-0) returns home to face Bellefontaine on Wednesday. Anna’s volleyball team dominated Covington on Monday to pick up its second consecutive lopsided 3-0 win. The Rockets opened the season with a 3-1 loss to defending Division III state champion Versailles but have been a roll since. They dominated Botkins in three sets last Thursday and followed with a 25-10, 25-17, 25-7 victory over the Buccaneers. Emma Meyer continued her hot start to the season. Meyer, a senior middle hitter who was first team all-Shelby County Athletic League last year, led the Rockets with 14 kills on Monday and had two solo blocks and six block assists. She has 41 kills through Anna’s first three games. Sierra Williams had five and Madison Roe and Macy Wiktorowski each had four. Lexi Wells had 26 assists, while Abby Counts had a team-high 10 digs. Liz Michael and Wiktorowski each had four digs. Wells had five block assists. The Wildcats lost a home nonconference match on Tuesday 25-9, 25-20 and 25-16. Allisen Foster had four kills while Hayden Riesenbeck had three. Alyssa Kemp had 14 assists and three aces. Olivia Bowser had 12 digs, Hannah Bixler had 11 digs and Mariah Booher had seven digs. The Cardinals beat Botkins 25-7, 25-7, 25-6 in a nonconference match on Monday in New Bremen. Taylor Paul had 10 kills for New Bremen while Macy Puthoff and Josie Reinhart each had seven kills. Rachel Kremer and Claire Pape each had six kills. Madison Pape had 17 assists while Abbi Thieman had 12 assists. The Cardinals had 13 aces in the victory. Botkins stats were not reported. Tiebreakers in two matches helped Sidney earn a win over Lehman Catholic on Monday at Sidney High School’s courts. Sidney’s Kara Mays beat Sarah Gibson 6-2, 7-6 (7-5 tiebreaker) at second singles. In second doubles, Sidney’s Ireland Ike and Alyssa Chavez beat Shannon Staley and Brieanna Werling 6-4, 7-6 (7-4 tiebreaker). Lehman’s Clarie Larger beat Hailey New 6-1, 6-3 at first singles and Sidney’s Mara Hecht beat Angela Brunner 6-2, 6-0 at third singles. Lehman’s Ann Pannapara and Keira Burns beat Sara Gibson and Jenna Allen 6-3, 6-4 at first doubles. “Claire played a solid, smart match against a good player and our first dubs team bounced back with a good win after some close losses lately,” Ungericht said. Sidney improved to 2-3 with the victory while Lehman fell to 1-7. Anna won a quad match at Shelby Oaks Golf Club on Monday that also included Sidney, Jackson Center and Houston. The Rockets had 172, while Sidney edged Jackson Center for second with 184. The Tigers had 185 and Houston had 187. Cole Maurer led Anna with 39 while Bryce Cobb had 42, Lucas Poeppelman had 45 and Bryce Havenar had 46. Trey Werntz shot 42 for Sidney. Nick Zerkle and Ben Spangler shot 47 while Mitchell Larger shot 48. Trent Platfoot led Jackson Center with 42. Christopher Elchert had 47 and both Carson Regula and TJ Esser each had 48. Tyler Kies led Houston with 45. Cole Pitchford had 46 and both Ethan Funk and Jon Steihan had 48. The Pirates earned a Northwest Central Conference win on Monday at Cherokee Hills Golf Course. John Zumberger led Riverside with 48. Zane Rose shot 52, Jayden Burchett shot 54 and Jaxon Heath shot 55. The Tigers earned a Midwest Athletic Conference win on Monday at Celina Lynx. The win improved the squad to 5-1 overall and 4-1 in MAC play. Connor VanSkyock led Versailles with 44. Alex Keiser shot 46 and Austin Pleiman and Isaac White each had 51. New Knoxville lost in a MAC match on Monday at Arrowhead Golf Course. The squad fell to 1-4 in MAC play with the loss. Ray Newton led the Rangers with 47 and Brandon Smith had 48. The Cardinals won a MAC match on Monday at Arrowhead. Caylie Hall and Sarah Parker each led New Bremen with a 47. Amy Balster had 51 and Cassie Stachler had 58. Taylor Homan led the Wildcats with 48. Layne Voisard had 51, Claire Lane had 73 and Haley Prenger had 77. This entry was tagged Abbi Thieman, Abby Counts, all-time, Allisen Foster, Alyssa Kemp, Claire Pape, Elaine Wiesenmayer, Emma Meyer, girls soccer, goals, Hannah Bixler, Hayden Riesenbeck, high school, Jada McMillen, Josie Reinhart, Kara Martin, Katie Atwood, Khia McMillen, Lauren Barker, Lexi Wells, Liz Michael, Macy Puthoff, Macy Wiktorowski, Madison Pape, Madison Roe, Makayla Hurey, Mariah Booher, Morgan Heckler, Olivia Bowser, Rachel Kremer, record, result, results, score, Sidney, Sierra Williams, soccer, Taylor Paul, Volleyball, who won, Xenia. Bookmark the permalink.